Uncorked and Cultivated is committed to sharing all of our wine industry knowledge and making sure all of your wine questions are answered. Our principal and wine educator Peter Scudamore-Smith, Master of Wine is ready to impart his tasting skills to small groups (one, two or three persons) as your personal wine educator. Peter has spent 20 years qualified as a Master of Wine. His wealth of experience spans 31 years judging wine and 29 years conducting wine education courses. establish a wine collection. Why not appoint Peter Scudamore-Smith as your personal wine buyer and investor? Contact Uncorked and Cultivated to register your interest in engaging Peter Scudamore-Smith MW as your private tutor and wine educator. 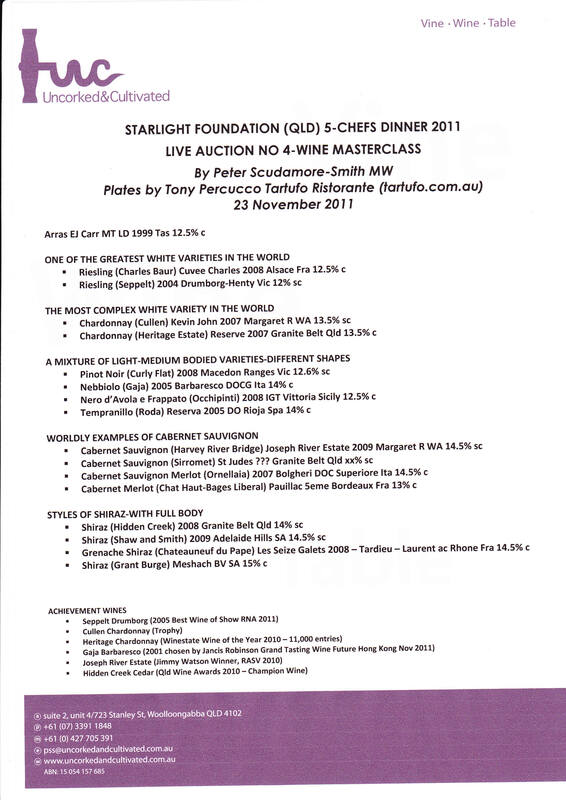 Uncorked and Cultivated supports Australian charities through wine and food masterclasses by Peter Scudamore-Smith MW. Expect some to have a French or Italian slant as he regularly travels through these countries.